We have thousands of properties for sale all over France. But we've no property for sale in Pléneuf Val André at the moment. And that's something we want to change. If you have a property to sell in Pléneuf Val André (or nearby) then act now to get a 50% discount. Just place your advert in the normal way (Click here to place your advert). Then send us an email quoting "Pléneuf Val André" and telling us that you you saw this offer. The little Breton town of Pléneuf Val André has something to offer everyone, however old or young, rich or poor. Situated on the north coast of Brittany, in the highly desirable department of the Côtes d'Armor, the town lies close enough to the capital of St Brieuc to make access to a large town very easy, yet the town itself is unspoiled and full of character. Pléneuf Val André has some of the most lovely stretches of sandy beach in the region, and is an unbeatable destination for families. Pléneuf Val André is renowned not just for the beauty of its beaches and the quality of its seafood (although it is indeed renowned for these things) but also for the friendliness of its inhabitants. The little town welcomes strangers, and those who have moved to live here permanently pay tribute to the ease with which they have been accepted. Children, especially, are given a very enthusiastic greeting, so anyone looking to make the move with young children on board would do well to consider settling here. Of all the pleasures of life in France, shopping and dining have to rank quite high on the scale. Although having less than 4,000 inhabitants, the town is very well equipped, and offers excellent shopping facilities as well as a great choice of very well respected restaurants. Seafood is, of course, a speciality, as the fishing port of Dahouet is right next door, ensuring a never ending supply of the very freshest that Brittany can catch. Most amenities are found here in the town, but should your needs be greater, then St Brieuc is close at hand. Pléneuf Val André even has a casino, for the nights when Lady Luck is leading you by the hand... at least, we hope so! Mooching? Well, there are so many pretty places to see and enjoy, from the fishing port to the coastal paths, to the attractive shops and cafés of the town, that simply "mooching" about is a highly rated pastime too. Try going down to the beach at sunset, when it will be largely deserted, and you might just catch one of those spectacular sunsets when the sand seems as aflame as the sky. There are many people for whom life is intolerable unless you have access to a golf course. Unfortunately, there are a lot of parts of France where a good course within easy travelling of your home or holiday home is hard to find, as France is only really beginning to catch onto the popularity of this game now. Luckily for golfers, however, Pléneuf Val André not only has a golf course, it has one of the top five golf courses in France! Of course, golf isn't the only sport in Pléneuf Val André. Golf widows and other non golfers can enjoy some really good horse-riding, fishing, swimming (the town has an indoor heated swimming pool), sand yachting, tennis, cycling, hiking, and much more besides. Pléneuf Val André holds many events throughout the year, including golf, tennis, sand yachting, volleyball and sailing events. There are also free open air jazz concerts given during July and August. Brittany's Côte d'Armor department is home to some of the loveliest beaches and most beautiful historic towns in France, so it is well worth spending a little time exploring the wider area. Visit St Brieuc, of course, and Dinan, with its mediaeval ramparts. Dinard, known as the Nice of the north, is well worth a visit, as is St Malo, an interesting port town which is great for shopping too. And then there are so many pretty villages and gorgeous beaches that it will be a long time before you run out of places to discover! There is an airport at Dinard and Rennes. Dinard is served by Ryanair and Aurigny, while Rennes is served by flybe and Aer Lingus. Those who like to travel by boat (and it is always handy to have a car as it makes days out so much easier) can take the ferry to St Malo. Or alternatively, if you are travelling by train you can take a TGV as far as Lamballe or St Brieuc, and then continue by coach from there. Do you know Pléneuf Val André better than we do? Do you have photos of Pléneuf Val André? WHERE IS Pléneuf Val André? Pléneuf Val André is located in north-western France. It lies in the north-east of the Côtes d'Armor department. 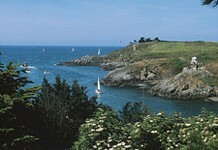 Access: By air: Fly to Dinard or Rennes. By boat: The nearest ferry port is that of St Malo. By train: The TGV stops at Lamballe or St Brieuc. Economy: The economy is based on fishing and tourism. Interesting fact: The golf course at Pléneuf Val André is one of the five best courses in France.